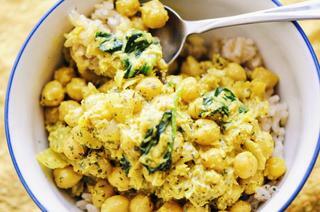 A super creamy, healthy, easy, filling and delicious Coconut Chickpea Curry. This flavorful Indian dish is vegan, gluten-free and makes amazing leftovers perfect for lunch or dinner! This beautiful & delicious curry is chock full of creamy coconut flavor! It is easy to prepare, full of protein and nutrients, and so incredibly tasty. If you are looking for a hearty, healthy, and filling dish that is also big on flavor -- this is it! In a saucepan over medium-low heat, saute onion & garlic in coconut oil for 5-10 minutes, or until onion is translucent & beginning to turn golden.Toss in your spices & cook for 2 minutes longer.Add coconut flour, shredded coconut, and coconut milk. Turn heat up to high, bring to a boil, stir well, cover & lower heat to simmer. Simmer for 10 minutes.Toss in your greens & let wilt.Remove from heat & let stand a few minutes before serving.Best served over a bed of brown basmati rice. Enjoy!